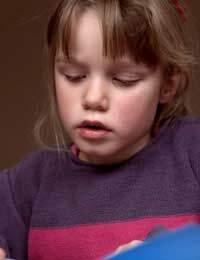 Children who are deaf or experience some degree of hearing loss face extra difficulties when communicating. Learning to lip read, alongside using a hearing aid, can be a useful skill to learn and help improve their learning and communication. As the name suggests, lip reading involves ‘reading’ the movements and visual cues of the spoken word. It’s a skill that has to be learnt and can take time to master, but for those that do, it adds an extra degree of understanding to communication and can help boost confidence and learning. As well as looking at the movement of the lips and how different words, phrases and syllables are pronounced, proficient lip readers study more than just the mouth. They look at the whole of the face for clues, including the eyes, facial expressions, eyebrows, the lower jaw, tongue and gestures a person makes – just like a hearing person would do when picking up clues about the feelings and emotions going into words and phrases. Children are likely to pick up basic elements of lip reading at home, as they watch parents and siblings talk to one another and interact. But one of the best ways of learning lip reading properly is to go to a lip reading class or have one-to-one lip reading sessions. As with learning any new skill or language, there are some problems and difficulties to overcome when learning lip reading. The biggest issues involve accurately making out what different words and phrases mean or are being said. For those with partial hearing, and who are relying on hearing some degree of the words, background noise can distort words and make it very hard to understand. For the fully deaf, the main problems involve people talking too fast, not pronouncing words properly, using slang, poor lighting in a room which makes it difficult to accurately see faces and facial expressions, people putting their hands over their mouths and even men who have beards or moustaches. There’s also the issue that some words look the same, producing the same type of lip movements when said. Common mistakes when lip reading including mixing up words such as ‘chair’ and ‘share’ or ‘share’ and ‘shoot’ as the words look the same when said. How Successful is Lip Reading? Deaf children who learn lip reading from a young age can become proficient in lip reading, with it proving to be a successful method for them. It can be more difficult to learn for older children or young adults, as it involves having to retrain yourself and think in a different way – looking at how people speak, rather than automatically hearing the words tumble out of their mouths. But with practice it can certainly be achieved. It’s not ideal to rely on lip reading alone and, ideally, should be combined with the use of a hearing aid or sign language, as this provides a more rounded communication system. Learning to lip read take a lot of skill and effort, and can be enormously draining for a child, but the ability to understand, appreciate and interact with others in the world around them is the greatest reward.